View research and analysis, presentations and submissions, and other resources from IBP Kenya related to Kenya’s 2015/16 National Budget. 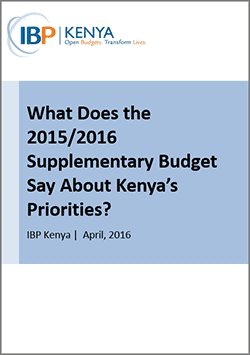 What Does the 2015/2016 Supplementary Budget Say About Kenya’s Priorities? This short brief highlights major changes in the national government’s supplementary budget 2015/2016. It is notable that a number of these changes reduce funding for programs that have been described by government as priorities in the past few years. These reductions should be thoroughly debated, particularly in the context of a supplementary budget that increases the overall size of the budget. This note updates two previous analyses that used budget data from the 2012/13 financial year: The Right Priorities? Understanding What the Kenyan Government Spends Money On and The Right Priorities Revisited: Understanding What the Kenyan Government Actually Spends Money On. The information contained in this series of notes is critical for interrogating the 2015/16 national budget and asking how priorities are changing over time. This note compares allocations for the health sector between the years. This table lays out the difference in information available in Kenya’s 2013/14, 2014/15, and 2015/16 Program-Based Budgets. This presentation highlights recent budget trends in allocation and expenditure, implications of past performance and what’s new in the 2015/16 budget. Read our note on the same topic for more analysis. This presentation explores how the national government has built on successes in program-based budgeting and how it can address the challenges of 2014/15 in 2015/16. This submission to the Senate explores the issues that should be considered to improve fairness in revenue sharing in 2015/16.